3D poses in the wild dataset. We combine IMUs worn on the body with a moving camera and 2D human pose estimation, to create 3D reference data of people in real-world scenes. 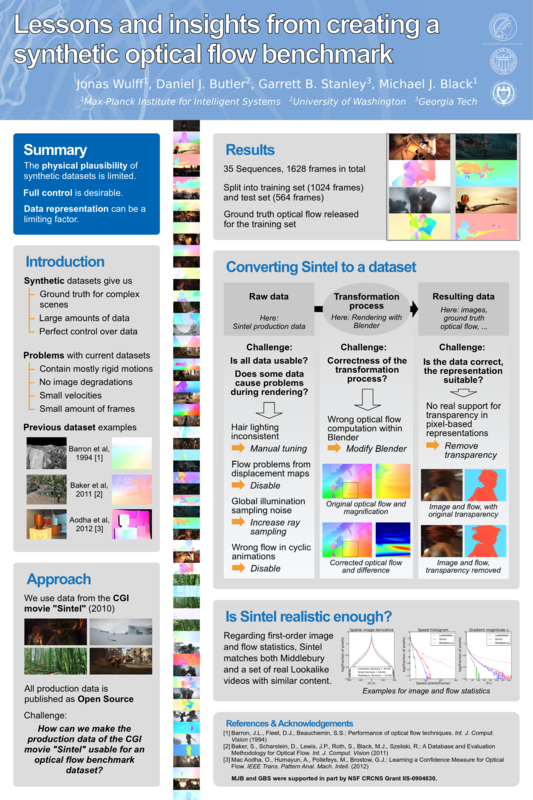 Datasets with ground truth have driven many of the recent advances in computer vision. They allow evaluation and comparison so the field knows what works and what does not. They also provide training data to machine learning methods that are hungry for data. Code is equally important as it supports reproducible research and enables the field to build on past results. With freely available data and code, the whole field moves faster. We have played central roles in many influential datasets and evaluations in the field including Middlebury Flow, Sintel, KITTI, HumanEva, FAUST, JHMDB, and others. Over the last three years we have released several major datasets related to faces, hands, 3D bodies, clothing, animals, optical flow, and IMUs. As an example, we showed how to use our human body model to render synthetic people in synthetic scenes. While not fully realistic, this data is useful for training networks to estimate depth, optical flow, segmentation, and 3D pose. Our code for estimating SMPL from images has helped drive the field to solve this challenging problem.